A sister site to the toxic waste dump school at North Reddish had to be evacuated on 13/7/12. Coincidentally also on 13/7/12 Barry Khan, Council Solicitor at Stockport Council, again branded all my questions about the toxic waste dump school as "vexatious". I have repeatedly asked them - Khan, Webb, Sager, Boylan, Derbyshire, Weldon, Pantall, Bodsworth, Smith, White, Candler et al about the monitoring of dangerous landfill gases on the site. All my questions for circa 6 years have been branded as "vexatious". This is another Aberfan waiting to happen. "We know Adswood is gassing; we know Windmill Lane and Ruby Street in Denton are both gassing (houses were evacuated on Ruby Street 20 years ago); and now Guide Lane in Audenshaw!!!" It is a waste of money and "vexatious" to ask about the safety of 550 primary school pupils and 78 babies in the nursery with regard to dangerous lanfill gases, but it is fine for the same department to apparently spend nearly £8000 in 2011 at racecourses!!! Only in Stockport and only under the LibDems. The toxic waste dump school at North Reddish, as I said all along and as Stockport Council knew all along, is too small. Why has the Council - Mr Andrew Webb, Ms Donna Sager, Mr John Schulz, Mr Eamonn Boylan, Ex-Councillor Goddard, Councillor Derbyshire, Councillor Weldon, Councillor Bodsworth, Councillor John Smith, Councillor David White, Councillor Kevin Hogg, Councillor Martin Candler, Councillor John Pantall, Barry Khan - spent £10 million on a school which was never big enough? Why did they lie and say I was "vexatious" when I correctly pointed this out at a time when a different, big enough site could have been chosen? It is an offence under the Fraud Act 2006 to act knowingly to cause someone a loss. 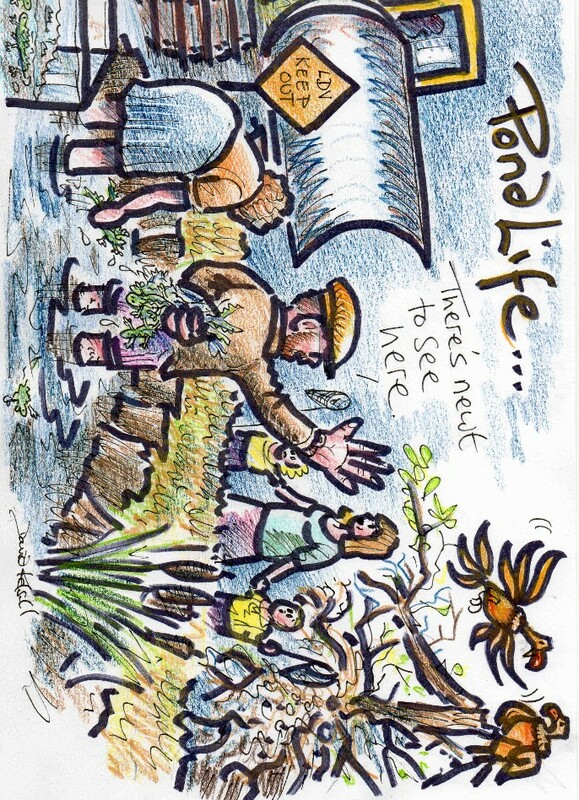 In this instance the council taxpayer has suffered a multi-million pound loss. It is an offence under the Fraud Act 2006 to refuse to disclose information when you have a legal duty to do so, in order carry out such an act of fraud to cause somebody a loss. The above-mentioned stand accused of being complicit in a multi million pound fraud. In the above agenda document from the Executive Meeting on 9th July 2012 the Council admits to a 21.6% shortfall in places in North Reddish. 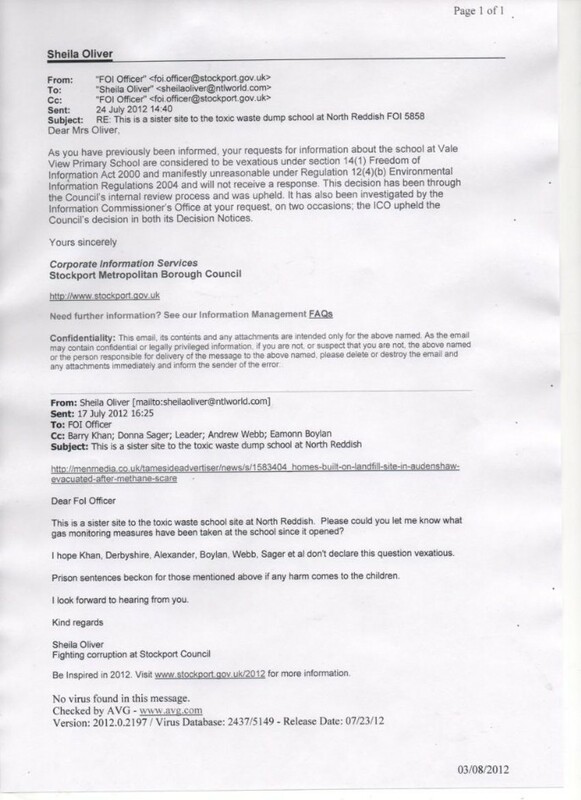 They knew back in 2006 (please see documents below on this page) that the school was not big enough, so why was this fraudulent scheme pursued and why is Khan still trying to cover up the fraudulent activities he, senior council officers and LibDem Executive councillors have been engaged in? 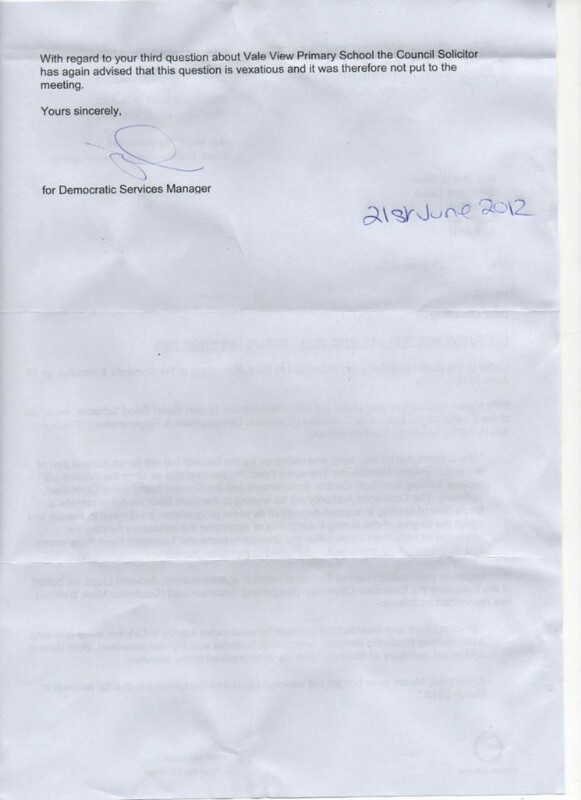 13th July 2012 and Khan, Council Solicitor, still says my requests are "vexatious". I think Khan has a lot to hide. 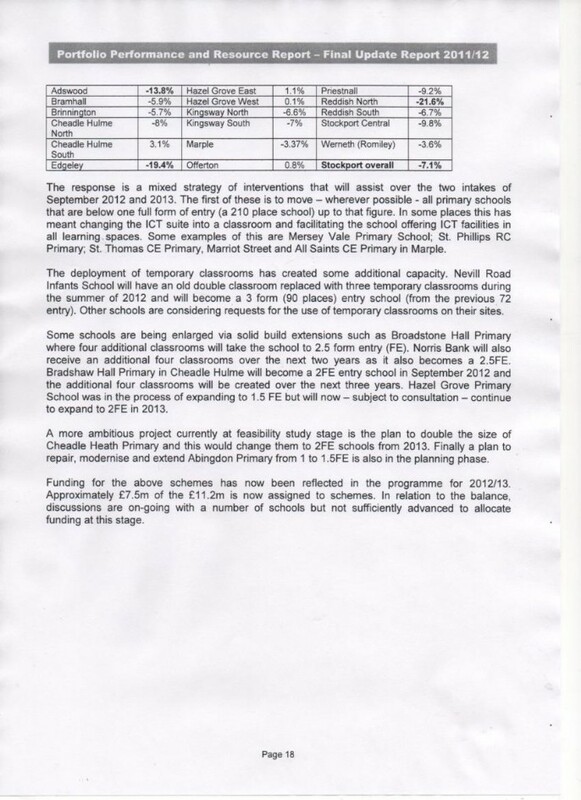 One of the issues I have is that NPS Stockport severely overcharged us for the work on the toxic waste dump school. The Council itself is admitting there appear to be problems with NPS (see documents below), so how can Khan claim that my questions are vexatious? Please see above. On 21st June 2012 the Council Solicitor, Barry Khan, said my question regarding this school was "vexatious". This is a £10 million pound school built deliberately too small with the full knowledge of Mr Khan for many years that it was being built too small. I have to ask myself, and not for the first time, whether Mr. Khan is a fit person to hold public office. Within one year of the new school opening, it is not big enough and they are talking about having to re-open one of the old schools. If I have spent the huge sum of £10 million, why isn't the school big enough? They knew all along the birthrate in the area was rising sharply. When I informed Stockport Council that the brown asbestos was being incorrectly removed, they said I was "vexatious" and refused to act. There is much, more wrong Stockport Council has done regarding this school in terms of planning abuse and the failure to provide playing fields, the problems they have caused local people and the dangerous traffic situation. 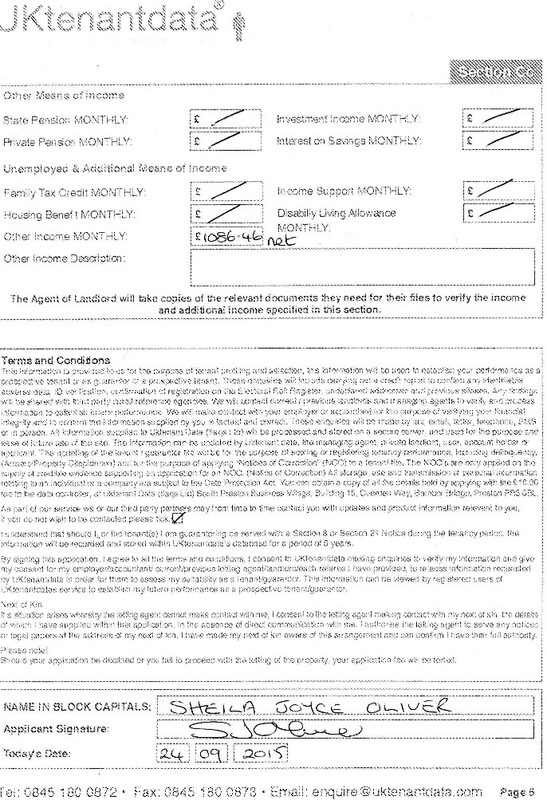 These problems are detailed on the following pages. This site is still under construction - there is so much more yet to post up about the disgusting things done here by the LibDems who rule Stockport and senior council officers. I have put up evidence in great detail to help the lawyers of children who fall sick as a result of the actions of the dodgy few. regarding a Design Change Order Log. The information you have requested is not held by the Council." In other words, the Council hasn't got a clue how much the school cost!! !